Looking for the best tools, equipment and supplies that you could use to keep your property snow and ice-free during the cold season? If that’s the case, start your search by identifying and comparing the best models of heavy duty 14 cubic feet grit bins brought to you by The Workplace Depot. 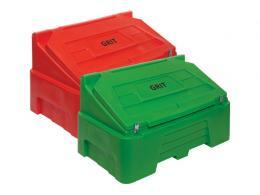 What Is the Purpose of the Heavy Duty 14 Cubic Feet Grit Bin? Regular snow removals become easier and much more enjoyable once you start counting on tools and supplies that help you store and distribute salt or grit on different surfaces with minimum effort. The heavy duty 14 cubic feet grit bin can be listed in this category; its sturdy design and plethora of featured geared towards your comfort and convenience have turned this item into a bestseller. Feel free to use this handy storage solution to deposit grit onsite and remove ice and snow with ease anytime, anywhere. Due to its practical design and sturdiness, this product is suitable for a wide range of outdoor applications and can be used on your company premises, in parking lots, driveways, patios and pathways. 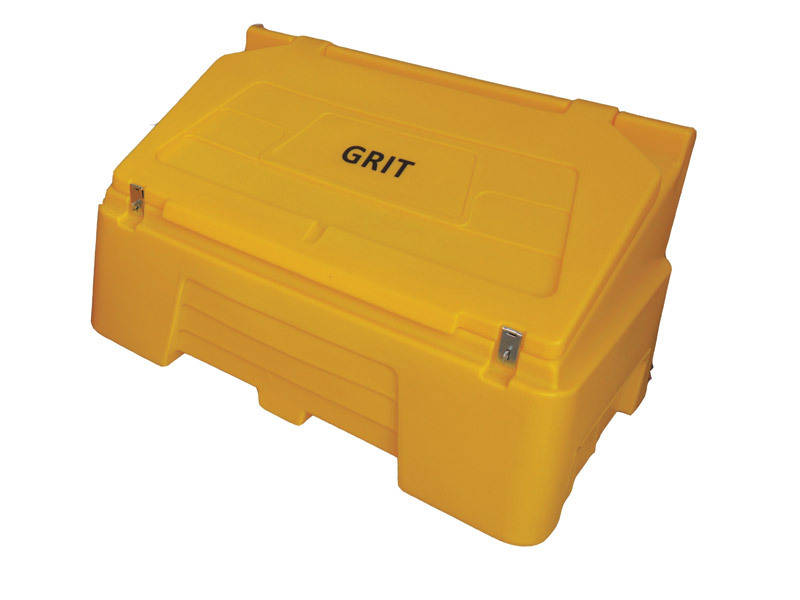 The grit bin that we provide is big enough to hold 400 litres, and can effectively respond to the needs of both households and businesses looking for a heavy duty, inexpensive grit storage solution. This product is a great choice for households and businesses requiring affordable snow removal equipment designed to ensure many years of uninterrupted service. 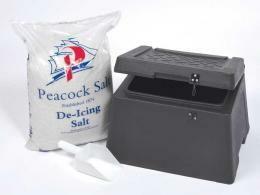 If you need to use and store a large amount of grit to remove snow and ice accumulations in any outdoor environment, count on the heavy duty 14 cubic feet grit bin to hold and protect your supplies. Its ideal exterior dimensions-1260(H) x 750(W) x 710(D) (mm)- let you unlock and explore a plethora of options in terms of onsite storage. 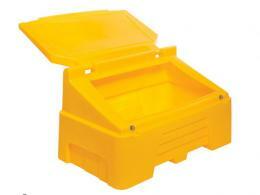 Moreover, its hinged lid ensures a superior protection from a wide array of factors, including water, debris and dust. This product is made of medium density polyethylene and will manage to preserve its original attributes in virtually any environment. Its robust construction enables you to reuse your favourite grit storage option over and over again, without noticing any signs of wear or discoloration. Available with two lockable clasps, this bin offers a superior protection for your contents and also prevents damages associated with acts of vandalism. This item is available in three colours-red, green and yellow, and comes with or without salt. Order yours today and make the most of free shipping and high quality standards linked to incredibly low prices.